The Conversation Contraption is a micro-festival of circuitous communication, featuring the League’s artists and collaborators as they rewire and reinterpret conversation. Based on the work they developed while in residency at the Casula Powerhouse, the League of Imaginary Scientists and Tasmanian intercommunications artist Pip Stafford – Professor Swift, in collaboration with local and remote interlocutors, present The Conversation Contraption. Presented in Australia at the Casula Powerhouse in New South Whales and 6A ARI in Hobart, Tasmania, viewers could interact with remote artists Saoirse Higgins, Kelly Andres, and Steve Shoffner (the alter-ego of the League’s Dr. Schleidan) and local artists Susan Hawkins, Cat Jones, Melissa Ramos and Rhys Turner. In Tasmaia, newly local Hobart artist Nancy Mauro-Flude joined Stafford and the League in enacting the contraption. Their interactivities offer a smorgasbord of inventions and communication artifacts. The contraption entails tin cups on strings with tonal responses, secrets told through megaphones, and mechanized interactions. Automatic response systems, the waveforms of speech, forgotten statements and recorded dialogue add to local and long distance exchange. Viewers and artists operate the contraption by engaging in impromptu dialogue, telematic communication and redirected data streams. The Conversation was initiated by Tasmanian artist Pip Stafford (Professor Swift) and the League’s Dr. Gomez while at simultaneous residencies at CESTA in the Czech Republic. At the time, Pip Stafford’s work involved approaching and communicating with local Czechs with a limited phrase book. Her project placed these interactions into an context. The League of Imaginary Scientists often invents or uses everyday devices for extraordinary means, such as their time travel goggles and teleporting barbecue. The Conversation Contraption is a happy marriage of the two. Research coordinator, Dr. Gomez, and the League’s head of unnecessary inventions, Professor Jojo Johansen, along with Tasmanian artist Pip Stafford (Professor Swift), were artists in residence at Casula Powerhouse in October, where they collaborated with local and international creative communications sleuths for the development and initial presentation of The Conversation Contraption. 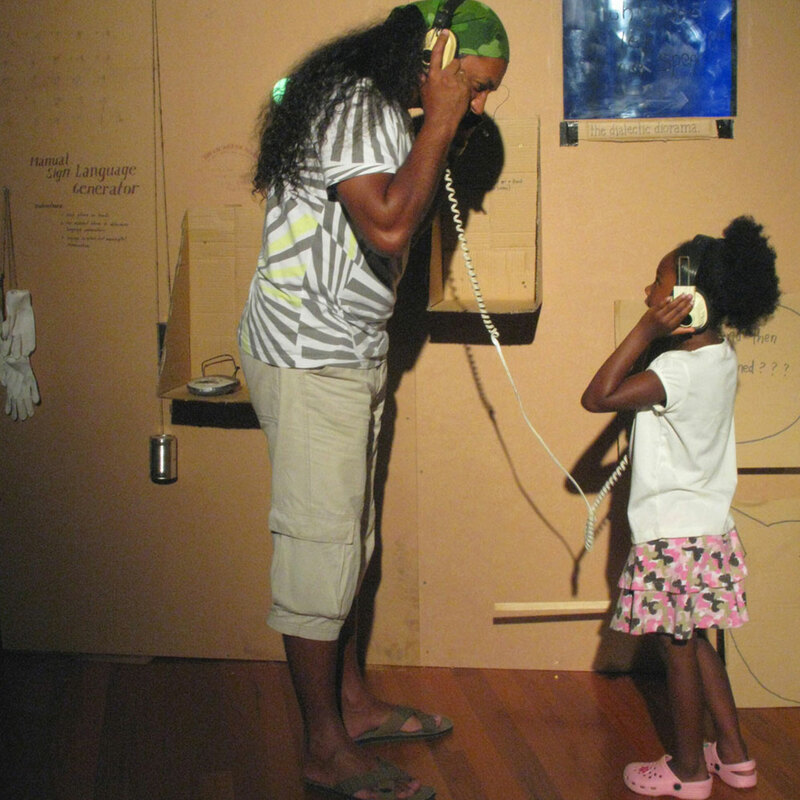 Casula Powerhouse, an international centre for cultural diversity in the arts, was at the time exploring the theme Intersections with cultural exchanges and residencies that examine the way in which we talk to each other. The Conversation Contraption reflected the aims for the residency to engage with the local community. In alignment with Casula Powerhouse’s theme of intersection and intercultural communication, the 2-day festival on communication involved several local and international collaborators working with interactive technologies and conversation in their art. SIX_A Artist Run Initiative is an artist run space that consists of studios and a gallery space. 6A supports the creation of new art forms, fosters collaborations, and celebrates hybrid art and untraditional exhibitions and hosted the second festival of communication contraptions, miscommunications, and translations. Supported by Arts Tasmania: Pip Stafford and the League of Imaginary Scientists were the recipients of the first Cultural Collaborations grant offered by Arts Tasmania. The grant supports the development and exhibition of their collaboration by funding the artists’ travel and their joint work. Electrofringe: Electrofringe hosted the League of Imaginary Scientists for their festival and facilitated the group’s residency at Casula Powerhouse, enabling the development of their new work. The Recovery Shop: Hobart’s waste management centre and tip shop, The Recovery Shop (Brad Mashman), generously supported the exhibition by providing used items for the League and Stafford to reinvent as integral communications components in their contraption.